The iM7 instantly reminds us of a classic boom box design, except that in the place of a twin cassette deck you get a spring-loaded iPod-dock loading bay that smoothly flips out with a push and click. A wheel clamp then tightens the grip on the iPod, setting things firmly in place for travelling. The 'iM' in the model name stands for inMotion, and true to form the speaker travels well. Two bays of 4D batteries access underneath the iPod tray mean you can take the iM7 out and about with ease. A rubber-lined handgrip helps things further. A wireless remote parks into a slot around the back of the speaker above a generous rank of input and output audio ports. 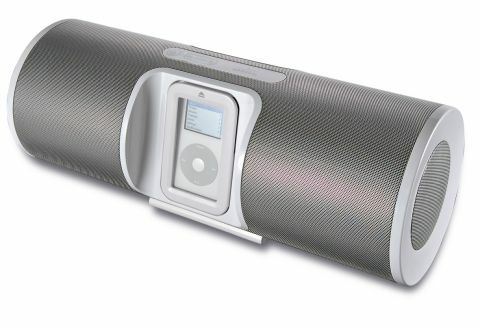 Among these there's a 3.5mm audio input, an output for headphones, a remote with extra treble and bass controls, and both an S-Video and composite out port so you can play a video feed from a video iPod through a compatible TV with the sound pumping out of the iM7. And it does pump. This would be a great unit for the party-minded, people who love a lusty bass. The bass is pretty full-on, powered by a sideways poised 4-inch subwoofer which can actually be quite overpowering, even on bass-light acoustic melodies like Nick Drake's Time Has Told Me or Dylan's Maggie's Farm. It lacks the tightness or detail of the Apple Hi-Fi or warmth of the SoundDock, but at nearly £100 less than either, it's still perfectly acceptable, and you can always turn the bass down using the remote. Treble and bass controls are not an option on the other two, except through an iPod EQ setting.